Last week, my girlfriend and I got to play Fortified from Clapfoot Games, a third person shooter with tower defence elements. We managed to play the first five levels of the campaign, and while there were bugs and oddities in the early build, the game is shaping up to be a solid offering from the Toronto developer. Personally, I've never played a game like this. A mix of fast-paced third person shooting, and strategic tower defence building. The beautiful classic-looking comic book style cinematics introduce you to the 1950's USA where you must defend your rocket ship from waves of aliens. You choose from four different classes, including the Agent who is sort of your machine gun/assault character, and Rocket Scientist who is your explosives expert. Once this is done you can pick your loadout of weapons and tools. To start out you only have a few weapons at your disposal, but as levels progress you can upgrade your current weapons or buy new ones. The first level starts off pretty slow and steady, while the designs of future levels include multiple spawn points, and paths for aliens and multiple rockets to protect, the first level is a small alleyway with a small route to the rocket where you can set up your turrets, mortars, snipers and more. Your characters control tight, and with the lack of a cover mechanic, it's meant to be a fast-paced shooter which is does really well. Placing your defensive items is quick and easy, and upgrade points let you customize your play-style. Co-op was key for us. At first we had evenly spent our upgrade points to both include anti-air and ground attacks, while also splitting the map to have one person cover each side. After some mission failures, we decided to focus our points and spread our attacks evenly through the map which saw greater success. The game does include up to four player online co-op, and while the game doesn't have split-screen, two player online was really silky smooth. Fortified was a lot of fun and now one of my most anticipated games. It is currently slated for an early 2016 release on Xbox One (which is the build we played), and Steam. 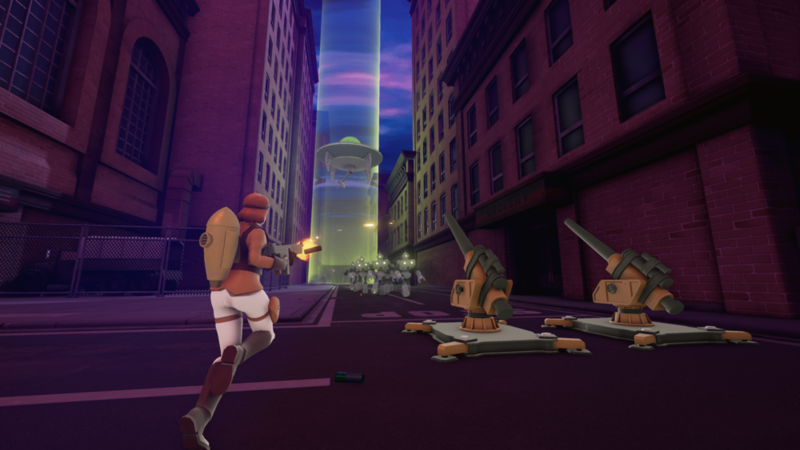 You can follow the developer on Twitter, and stay tuned to TorontoGameDevs.com for the latest on Fortified as we get closer to its release.